Network Configuration Management » What is VLAN? A virtual local area network, or VLAN, is a group of logically connected devices with all the functionalities of a local area network (LAN). Unlike in a regular LAN, devices within a VLAN don't have to be physically connected or on the same network to function. The connection between devices in a VLAN is established logically, which adds flexibility to the network. You can also make changes in the network easily when using VLANs, since connectivity is not affected by the geographical locations of the network devices. Generally, VLANs are used for better network management, security, and scalability. In a conventional LAN, devices have to be physically present in a particular location. If you’re running a LAN and a user moves to a different location, you need to make changes to your network infrastructure. With VLANs, network devices have no geographical restrictions; you can configure devices centrally irrespective of their location. With VLANs, you don't have to make physical changes to your network to improve performance. You can compartmentalize your network's traffic by creating individual VLANs for every user group. For example, you can create separate VLANs for operators and admins. In this case, a bandwidth bottleneck in the admin VLAN will not affect the operator VLAN since they function as two different networks. VLANs separate users into logical groups that enable them to access only the devices that are essential for their work. In case of an external attack, it will be contained within the VLAN where it originated, while other users can access the network hassle-free. Identifying and troubleshooting issues is simpler with VLANs. With users working in small groups, issues can be narrowed down quickly. You can also troubleshoot more effectively with users connected in small groups. You can manually configure a VLAN with the help of PuTTY, but doing so would be time-consuming since every device has to be configured individually. You can automate such operations with network configuration management software. These tools can help you apply changes to device configurations in bulk. With Network Configuration Manager, you can configure a VLAN in your switches and start managing traffic efficiently, enhance security, and swiftly troubleshoot network issues. You can configure VLANs in Network Configuration Manager with the help of configlets, executable configuration templates that help you automate repetitive and complex network operations. You can create custom configlets to suit your network and device requirements. Configlets can be created and executed using Network Configuration Manager in three different modes: file transfer, script execution, and advanced script execution. To configure a VLAN, you can create the configlet in script execution mode. 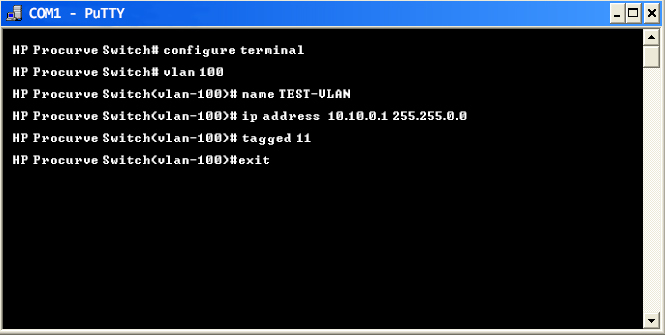 Shown below is an example of configuring a VLAN in a HP switch using PuTTY. With configlets, configuring VLANs are simpler. Configlets can be used to configure VLANs in multiple device simultaneously. Shown below is a sample configlet to configure a VLAN in a HP switch.